Craftin' Caro: January's FREE Tutorial offer! Receive this "Love Sparkles Love Notes" Tutorial by email FREE with any order placed with me or paid class attendance in January 2010! Share the sparkle of love and excitement of Valentine’s Day by creating these unique love notes using the Love Sparkles Simply Scrappin’ Kit. Beautiful enough for you and simple enough for the kids, this project is perfect for making class Valentine’s or for giving to friends and family. 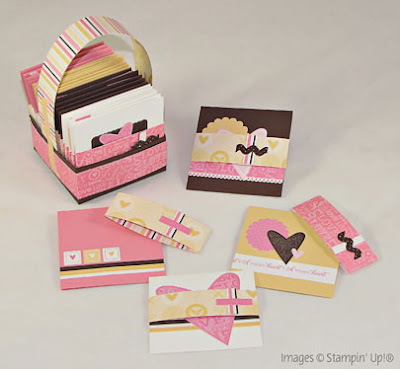 This project features warm and traditional Valentine’s colours with a bit of a trendy flair. The self-adhesive die cuts make assembly quick and easy. Since the project uses minimal other supplies, it is super easy to prepare and makes great kits, too. 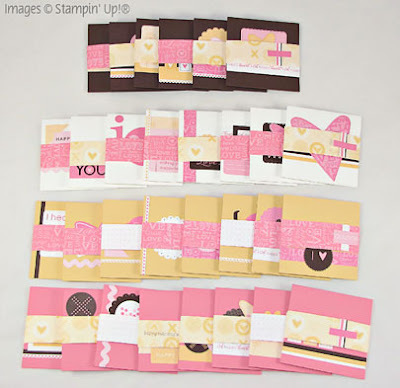 It’s all the inspiration you need to make beautiful and thoughtful love notes for giving this Valentine’s Day or for sharing sweet thoughts left on a pillow or in a lunch sack throughout the year!